Borgen is the latest Nordic Noir drama sensation from the producers of the acclaimed series The Killing. Following the intricate and complicated lives of politicians, media spinners and the reporters who feed off their triumphs and failures, Borgen uncovers a world of political and personal intrigue. The setting is Borgen, the nickname for Denmark's Parliamentary building, otherwise known as "The Castle”. After scoring her party a lands..
Birgitte Nyborg has been Denmark's Prime Minister for two years - years that have taken their toll on her private life. She must now balance her role of PM with that of divorcee and single-mother. Politically, she has succeeded in earning the respect of both her political allies and enemies, but tensions between parties are mounting. Denmark's participation in international wars as well as certain central domestic policy issues are driv..
Can you attain power and still be yourself? Over two years have passed and Birgitte Nyborg is no longer the Prime Minister of Denmark. Disillusioned with the way her old party is heading she decides to try to make a comeback by publicly challenging the incumbent Party Chairman. Failing narrowly in this attempt, Birgitte assesses her options and concludes that her only way back into politics is to start again and found a new political pa..
From the award-winning producers of The Killing, DR, Borgen is a critically acclaimed Danish political thriller series consisting of three ten-episode seasons. First broadcast in the UK on BBC Four, the series has since become a major cultural phenomenon and is now released for the first time as a complete trilogy box set. 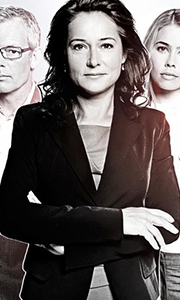 Set in a fictional version of Danish parliament - known as 'Borgen', the series follows the bottom-to-top rise of a..
Borgen is a BAFTA winning Danish drama series from the producers of The Killing. Following the intricate and complicated lives of politicians, media spinners and the reporters who feed off their triumphs and failures, Borgen uncovers a world of political and personal intrigue. The setting is Borgen, the nickname for Denmark's Parliamentary building, otherwise known as "The Castle . After scoring her party a landslide victory through her..